Keywords: Celebrity Accessories, Celebrity Style Watch, Individual Style, Who Wore it Best? In the world of easy, expendable fashion, it’s not uncommon to find yourself in the same room as someone who is wearing the same top, or pair of jeans, or carrying the same handbag. Your friend might show up in her new cardigan, only to have you exclaim, “I just ordered that same cardigan from Urban Outfitters.” Unless you wear head-to-toe vintage clothes, it’s hard to be entirely unique anymore. Celebrities run into this problem often, and since what they wear is SO public, they often get placed on “Who Wore it Best” lists. 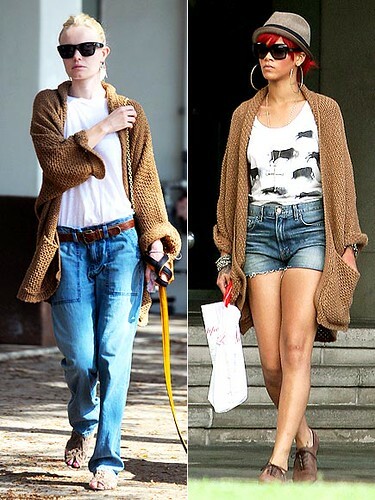 Pitting one celebrity’s style against another’s is often entertaining. Where most of them go wrong is wearing the same thing, down to the accessories and hair. Identical makeup, hairstyles, and belts make this look way too matchy-matchy. They accessorized the same down to the leopard print booties. It is impossible for celebrities to be prescient enough to know who will wear the same outfit as them at a premiere, or at another even across the globe. So, it’s understandable that not only do they find themselves in matching gowns, but in similar shoes, jewelry and hairstyles as well. We’re not suggesting they fire their homogenizing stylist, but what could help them here is to make the style more their own. Celebrities who end up wearing the same things, but adding their own flair to it, don’t fall prey to the “Who Wore It Better” dissect-a-thon. Same jacket, worn two completely different ways. Same slouchy cardigan that fits two different casual aesthetics. Both dressy looks wearing the same top, but their individual style shines through. While we love copying celeb looks, we don’t copy them exactly. We get the feel for their style and try to incorporate similar pieces. However, we always keep in mind that individual style trumps celebrity style. Learn to make your look your own with fabulous, curious, unique accessories. I know exactly what you mean – my friends and I have tons of the same stuff from H&M, ZARA, F21 and Urban O. It’s getting annoying.